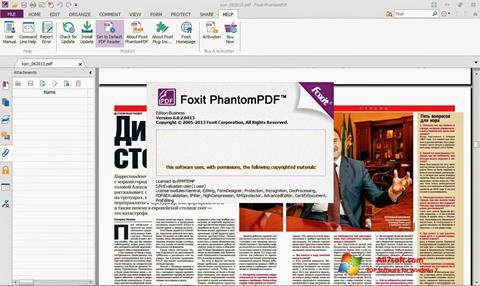 Foxit Phantom for Windows 7 - fast program designed to handle PDF. Allows you to merge and split files, design new forms, edit content, insert and delete pages, view basic information. The software is able to convert documents into PDF format and create, processing data from the scanner. Works with watermarks. Performs actions simultaneously with several documents without sacrificing speed and quality. There is a function to add comments, references, footnotes. You can free download Foxit Phantom official latest version for Windows 7 in English.